What role do our organs play in pain, stiffness and tiredness? The flexibility of our bodies is influenced by, for example, injuries, surgery or an unhealthy lifestyle. The body tries to compensate for a lack of flexibility which can then create tension, irritation and pain. Our organs influence each other and the rest of the body. For example, just think how much discomfort is cause by having a bad stomach. If one organ is not functioning properly, the rest of the body must compensate for this. From this perspective, back pain could arise from kidney problems because the fascial tissue membrane can have an impact on the muscles of the back, which in turn interact with other fascia and start to pull the muscles and vertebrae. By treating the tissue of the kidney and increasing its elasticity and blood circulation, the natural physiological motion of the organ can be restored. Thus the related muscles and vertebrae causing pain can relax. The kidneys work hard regulating liquid levels, blood pressure, pH values, etc. 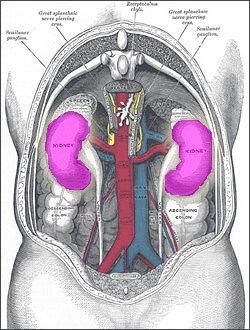 The kidneys have a fascia connected to the diaphragm that moves bout 5 cm with every breath. Just imagine how much your kidneys move in a day! We are not used to thinking in terms of rhythms and movements in our bodies. The fact that the heart beats creating a pulse is of course well nown. Breathing also has a clear rhythm that we are aware of. However, most of us are unaware of the fact that every organ has its own cycle of motion. Motion is a prerequisite for living a healthy life. By allowing free ovement, you improve the ability of your body to heal itself. The techniques I use have been devised by the French osteopath Jean-Pierre Barral who has developed techniques for visceral manipulation. This is a gentle treatment of the tissue around and inside the organs of the body. These organs are held in place by a structure of connective tissue. For our overall wellbeing and health, it is important that each organ has the necessary motion and blood circulation for it to function optimally. Visceral manipulation allows any restrictions in the movement of an organ to be treated.